"There are a lot of shortbread recipes out there, but these are special. Vel is my mom, and these are the best! At first it will seem that this dough will not go together, but after a lot of kneading, the butter will hold this dough together. You will get the greatest English shortbread that you have ever made." In a large bowl, cream butter and brown sugar until smooth. Sir in flour, and knead by hand until dough comes together. At first the dough will seem dry and crumbly but don't give up, keep mixing. Roll out the dough to 1/4 inch thickness, and cut with cookie cutters or press dough into shortbread molds. Place cookies 2 inches apart onto ungreased cookie sheets. Bake for 8 to 12 minutes in the preheated oven, depending on the size of your cookies. Do not let them brown. 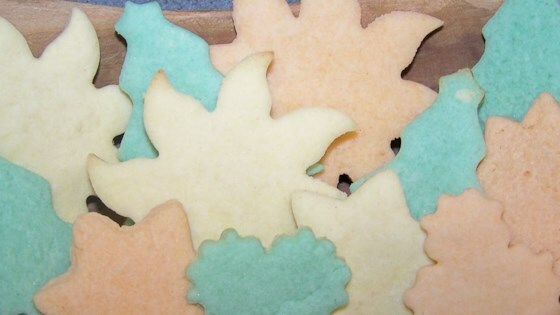 Remove from cookie sheets to cool on wire racks. See how to make the ultimate Christmas cookie. I baked these for the holidays and they were a big hit. My kids and I kneaded some mini chocolate chips into the dough and they were awesome! Lots of kneading but well worth it! I dipped half of the cookie in chocolate and it was oh so good! !